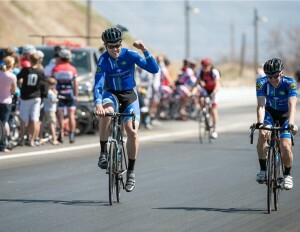 Cameron Hoffman celebrate a eammate’s victory. Photo: Ricky Bangerter. 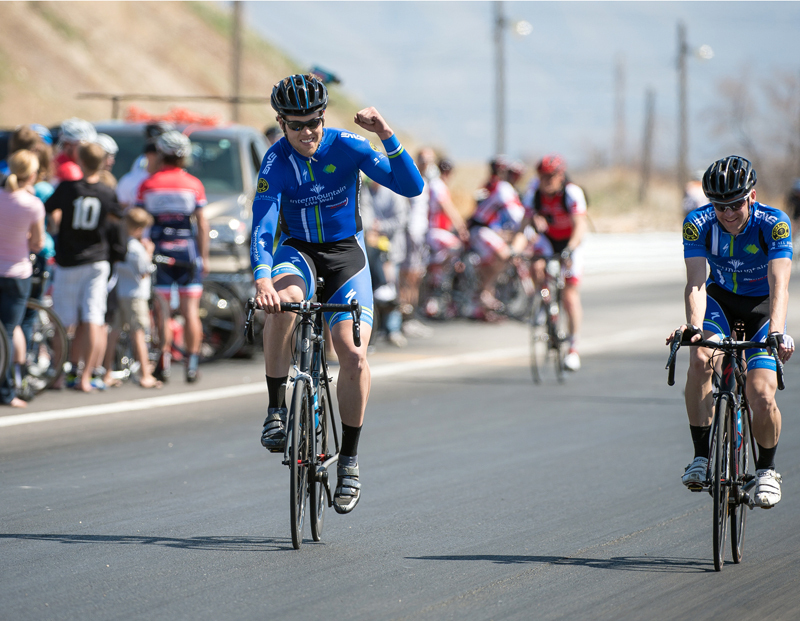 As we discussed in the March 2013 issue of Cycling Utah, at its essence competitive cycling is a team sport. The successful professional teams tend to be the most organized and unified, and the best riders in the world often make contractual demands and commitments based on which riders they will call teammates. What does that have to do with you? Everything. As you’ve inevitably experienced on any group ride or even a ride you started alone but finished with someone, how other cyclists ride affects you. Working with other riders, or keying off what they do, influences your effort and – ultimately – an outcome. In racing we call that outcome a result, good or bad. Using road bike group riding and racing as our context for this discussion, let’s consider in more detail the concepts presented in March. – Riding tempo. This is a pace established by a team to discourage drastic changes in speeds, and to discourage breakaways. It can also serve to reel in breakaways without necessarily expending the same energy as “chasing”. Cool, how do we implement? By having strong riding companions or teammates ride strong tempo at the front of a group, we encourage a steadier pace for longer periods of time. It can have the positive effects of discouraging hard attacks and, if one or more riders do storm off the front, gradually reeling them in. Without strong, willing companions setting a good tempo at the front of the pack, the pace can constantly change, making efforts more surgy and riders more antsy. – It’s all about the counter-attack. Unless a very strong rider attacks at just the right time on just the right terrain, an attack often doesn’t succeed in launching a breakaway or causing a split in the group. What any strong or well timed attack does tend to do is “soften up” the pack so that it is tired or beaten into submission when the next attack occurs. If timed just right, which is often just as the previous attack is being subdued, a counter-attack takes advantage of everyone thinking – or wanting to believe – that with a threat now neutralized, things will settle down. This is when the magic happens. I like to remind riders on teams I direct and those I coach that these aren’t just intense moments in a race; these decisive moments ARE the race. – Attacking as a decoy. As stated above, any type of attack can serve a purpose. On group rides, especially at designated sections of an established route, attacks can be a great opportunity for cyclists to push each other and develop tactical skills. In a race, attacks can always lead to gaps or breakaways, forcing other riders or teams to chase. When a team works together to take this kind of initiative, it enables its riders to “sit in” and rest, benefiting from opponents doing extra work while they save themselves for the next tactical and potentially decisive move. – Going with a breakaway vs. chasing a breakaway. We pretty much covered this last time: It is always much easier to jump on an opponent’s wheel as a breakaway is forming than to be in the wind closing a gap. Riding near the front and being vigilant can mean the difference between making the selection and missing out, the latter forcing your team to chase. – Chasing vs. bridging. There is a big difference between going to the front of the peloton and upping the pace to chase down a breakaway, and trying to get away from the pack to bridge. In the latter scenario, one or more riders must get away clean from the pack, opening up a sufficiently large gap, to get up to the breakaway without towing any (or too many) opponents in the process. – Waiting for a detained teammate. If a strong teammate gets sidelined, depending on the type of race, you need to know in advance how to deal with the situation. Do you drop yourself from the pack as the teammate gets a wheel from a support vehicle or wheel pit, or do you stop and give them your own wheel? Both options represent team racing at its best; you just need to know how to be a help as opposed to taking both yourself and the teammate in need out of the race. This requires discussion prior to a ride or race, communication during the event, and often a post-mortem follow up afterward to ensure everyone is on the same page and the group is making decisions that lead to a positive outcome for all involved. – Protecting your team leader. This paragraph will also serve as an important as-is repeat from the previous article. Mastering the following concept will improve your individual and team riding skills as much as or more than anything else you’ll learn on a bike. Cycling can be a very noble sport, with savvy and selfless riders doing everything they can toward the success of one or more teammates. Watching teams keep their leaders out of the wind, in good position without those leaders having to exert themselves too much, and led out for a clean shot at victory in the sprint is exhilarating. No matter how good you are, or how much potential you believe you have, if you don’t learn early on how to be an excellent team/support rider, or domestique, your opportunities will be severely limited. For elite cyclists, it can mean the difference between getting a pro contract and languishing forever in the land of could-have-been. For cyclists of all levels, the better a team rider you are, the more you will be a desirable entity for discerning clubs, teams and potential teammates. – Blocking and leadouts are both concepts that deserve and arguably require more detail than we have room for this issue. Let’s look a future issue for thorough explanation and guidance regarding how each can be ethically employed for desired outcomes and exciting team racing. Mark Deterline coaches some of Utah’s and California’s top cyclists, as well as triathletes, distance runners, cross-country skiers, motocross racers and boxers. Leadout Endurance Coaching provides completely customized training plans, bike fittting and biomechanics, and performance testing for athletes of all backgrounds and levels. Contact: [email protected] or visit 2thefront.com.